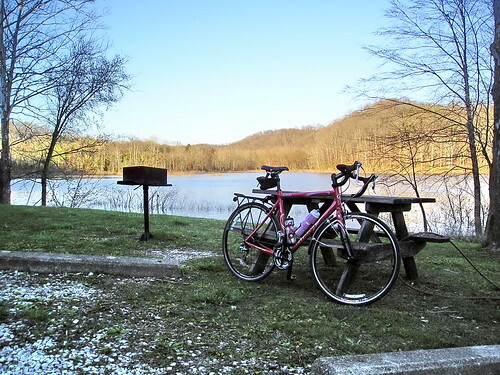 Jett has a post on his Atlanta Intown Cycling blog entitled “Cycling Karma,” where he posted a serene photo of Winn Park he hopes will make others feel good as well. I’m going to do the same thing here with a few photos; I hope he doesn’t mind my appropriating his term. Monday night, I rode a modified version of the Water Works ride, adding a jaunt down Shady Side Drive and the Moore’s Creek Road section. There were strong winds, giving me a tailwind on my way out, making the rolling hills a lot of fun — I rode most of the way out in the big chain ring. When I got to the water works plant, I checked my bike computer and saw that I had averaged 18.2 mph to that point … Woah! That’s unheard of, for me. 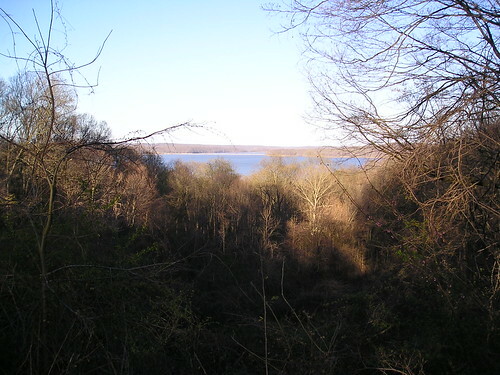 I took a brief break and rode down Shady Side Drive, where Sarah and I had gone on a drive. It was better than going down the adjacent road to the recreation area, as it doesn’t involve going down a huge hill, turning around, and climbing back up that huge hill. Instead, there are several more gentle hills. It didn’t add a lot of mileage to the ride, but it was a fun extension. I took a few photos of some of the great views. Of course, on my way home, that tailwind became a headwind, and it was quite a struggle at times. It was a great workout, though, which I badly needed. Riding the Moore’s Creek Road section was fantastic. I accelerated as I approached the hill, and picked up more and more speed. I did a little braking that I probably didn’t need to do, but I’m still gaining confidence. As I coasted downhill, my eyes watered, and tears started streaming from my eyes. Tears weren’t streaming down my face so much as straight back due to the wind at high speed. I even experienced that weightless-stomach feeling that you get sometimes in a car, almost as if I was about to take off in flight. It felt like I was no longer riding on the road — I was floating above it. 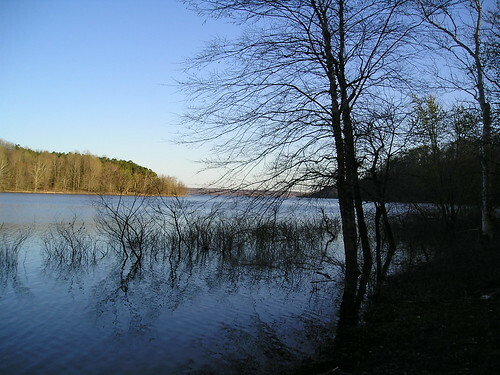 I stopped by the lake to rest again and take a few more photos. A great place to rest before a big climb. What comes down must go up (right?) so I had a climb ahead of me. I took it slow and steady and made it all the way up without stopping. It’s a long climb, with a pretty long steep section, so it felt great to make it all the way up. The rest of my ride was still tough, due to the wind, but I enjoyed it anyway. Last night, I rode Mount Gilead Road, and as I came around a turn, I saw two turkey vultures feeding on some roadkill. I kept my speed, and they let me get a lot closer than I expected before they took off. They flew into the air, and I stood up out of the saddle and was able to stay with them for a couple hundred yards, until they turned around and went back to finish their meal. Turkey vultures may be ugly up close, but the way they soar can be awesome — especially when you get to soar with them from only 20 feet away. 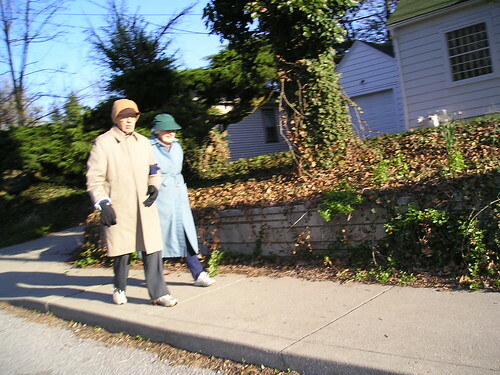 I got a photo of the old couple I routinely see walking during my commute yesterday morning. It’s not the greatest photo, but you can see her smiling and him waving (sort of). I was running a little late this morning and didn’t see them. I guess they’re more consistent with their walking time than I am getting to work. Yesterday’s commutes were pretty uneventful, but great. On my way to work, I saw an old couple walking in the opposite direction and realized I see them almost every morning. They don’t move very fast, but they still walk together every morning, and they really seemed to enjoy it. I am not really a “good morning” kind of guy; I’m not a morning person in the least, and I always dread getting up. Mornings are almost inherently not good, to me. However, riding to work on a beautiful morning and seeing that old couple, arm in arm, I couldn’t help myself. I said “good morning” to them as I rode by. They reminded me a bit of my grandparents, who took walks together for as long as they could, and I certainly hope that someday Sarah and I will walk together like that. I arrived at work with a dumb grin on my face. My commute this morning was good, too, pretty similar to yesterday’s. I saw the same old couple again, and once again wished them a good morning. I could see them smile back at me. I had tried to get a photo of the old couple yesterday morning, but it didn’t turn out too well. I tried again this morning, but I think I missed again. I might have to stop and take their photo sometime if they’ll let me, but I feel a candid shot would be better, if I can get one. I had one incident with a motorist this morning. I was riding on 7th Street, which goes through campus and is a two-lane, fairly low-traffic street with several stop signs. There was a pickup truck behind me that tried to pass me a couple of times, but there wasn’t room to pass. I was riding outside the “door zone” in case someone in a parked car opened their door. The guy in the truck behind me was clearly getting impatient, even trying to pass me within about 10 feet of a stop sign. When he failed to pass me at that stop sign, the guy in the truck laid on his horn and yelled something at me that I couldn’t understand. I had had enough;I wasn’t about to ride in the door zone, especially since there still wouldn’t have been enough room for him to pass me. So instead, I took the lane. It felt great to show this truck driver I wasn’t going to take his crap, and simultaneously assert my right to ride on the road and look out for my safety (and really, the safety of others; if the guy had tried to pass me with oncoming traffic, an accident surely would have resulted). When I reached the stoplight at Walnut Street, the light was red, and I turned around and stared down the truck driver. I wish I could have explained to him the safety reasons behind the way I was riding, but there wouldn’t have been time, and I don’t think he would have cared anyway.